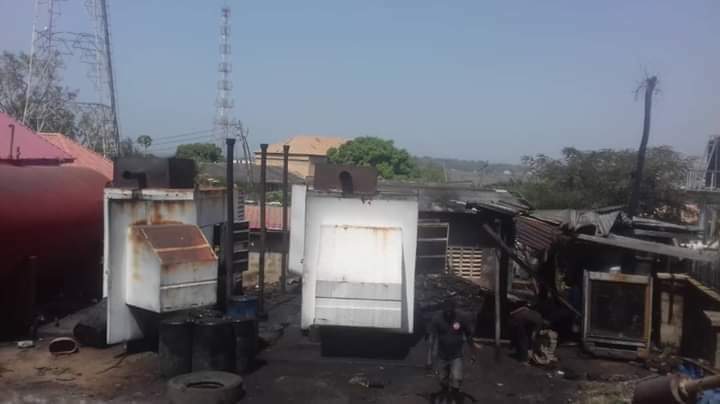 There was pandemonium at the Benue State Government House, in Makurdi, on Wednesday, when a section of the complex was gutted by fire. Although, no life was lost, the incident, according to witnesses, paralysed government activities within the complex and forced staff of the complex to abandon their duties for the a while. Sources within the government House told our correspondent that the fire started at around 1:00p.m from the transformer close to the generator room located around the account section within the government house complex. A staff of government house administration who pleaded anonymity disclosed that the fire started with a thick fume emanating from the transformer which also affected the generator room closed to the accounts section. He however noted that but for the generator set supplying light to the entire government house which got burnt, the level of damage was not too much as according to him, the combined efforts of workers and the State Fire Service stationed in the complex saved the situation. “The electric armoured wires supplying light to the account section, the main governor’s office and down to governor’s lodge, were completely burnt down.” he stated. Permanent Secretary Government Administration, Mr. Iangba Gabriel, who confirmed the incident said that the inferno did not extend to the main account, saying it was the generator plant which tried to malfunction but was immediately shutdown to avoid any damage. “It was not a serious incident and no damage was done. Those things you saw around the area were debris around the generator room that caught fire. “People are calling me from Abuja including our people who went to EFCC office, that they heard government house complex particularly the account section was set on fire. Infact, it was not true. The burnt wires and poles were properties of old Nitel not NEPA”, Iangba stated.